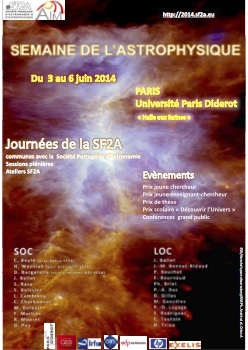 Welcome to the website of the Journées 2014 of the French Society of Astronomy & Astrophysics (SF2A). 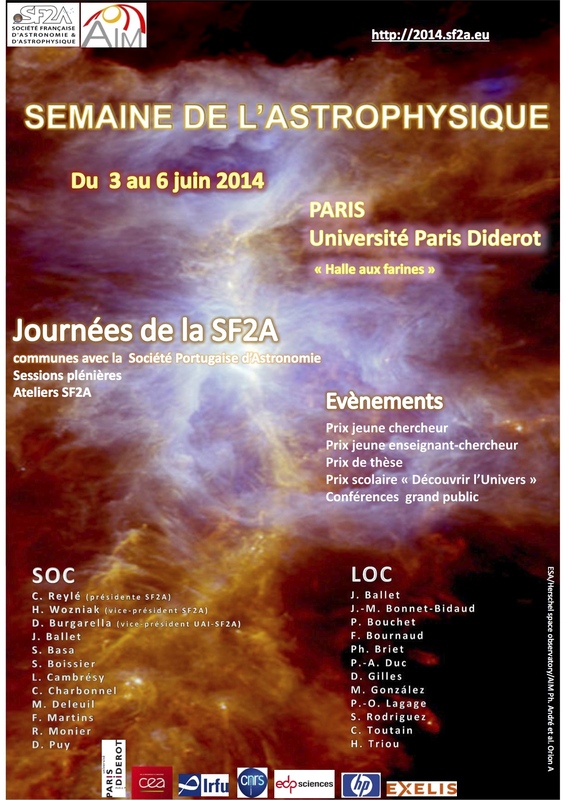 The "SF2A week" will be held from June 3rd to 6th in Paris (Tolbiac campus of the Université Paris Diderot ) under the auspices of Laboratoire Astrophysique Instrumentation et Modélisation. In 2014 our guest is the Sociedade Portuguesa de Astronomia. Mornings will be dedicated to the plenary sessions (scientific reviews, foresight presentations, GA ...) while the afternoons will be dedicated to workshops organised by the national programs (PN) and specific actions (AS) of CNRS/INSU. Download high resolution poster: jpg. Download high resolution poster: pdf. Click on the logos to visit our sponsors.